Lee – I understand your statement about Starbucks, but including Tim Horton’s in the same breath should be a crime. Down here in Buffalo, Tim Horton’s is becoming a local treasure. I brew it at home, and even when we go on vacation (including camping), I bring a can with me. I believe a good cup of coffee is like a good glass of wine: the quality of the drink is important, but the circumstances in which you drink it is even more important. For instance, enjoying a Sunday brunch with your family would create a wonderfully tasting cup of coffee, while downing a glass at 2am because a computer bug still isn’t fixed won’t taste good, no matter what blend you’re drinking. Maybe I just don’t know what I’m missing out on… I’ll hunt for some Level Ground and give it a shot. Haha – I knew that someone would take exception to me including Tim Hortons in the same breath as Starbucks. That aside you are correct that circumstances are important and even the best cup of coffee on the world will leave a bad taste under bad circumstances. Some of the best cups of coffee I can recall have been because of the good places and people I have been with. A hot cup of coffee on a cool morning on a canoe trip is almost certain to give you that ahh feeling. 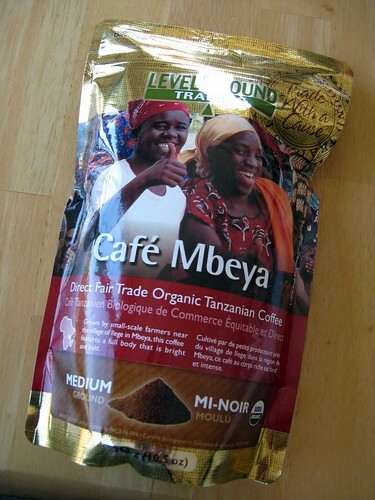 There are other fair trade coffee companies, Level Ground is the one that we consistently come back to. We usually buy it at the Ten Thousand Villages store, you could try finding it there. http://www.tenthousandvillages.com/ I find it does not have that over roasted burnt taste that I mentioned, but it is a nice strong cup of coffee that is nice and smooth. Compared to the local grocery store coffee it does cost a little more, but it is probably about the same price as the Tim Hortons stuff, and it does a little bit of good somewhere else in the world at the same time. You’re right. There is nothing nicer than starting the day with a good cup of coffee. A friend of mine who does consulting abroad brought me back some coffee beans from Columbia. It was the best coffee I’ve ever had. Unfortunately, I’m almost finished with it already. I hope he goes traveling again soon. My cup runneth low. That would be good coffee. We went to Costa Rica several years ago and brought back coffee. That was fantastic from what I remember. That was when we were still grinding our own beans. Maybe you will have to go and get some more beans instead of waiting.